Do You Have Quaker Ancestors? 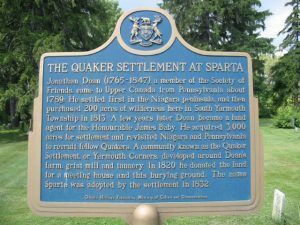 Quakers were among the very early settlers in Ontario, as well as other parts of Canada, settling as early as the 1700s. Immigration from the United States increased dramatically during the American colonies’ war of secession from Britain (aka the American Revolution). Quakers were early pioneers in areas of Upper Canada (Ontario), including York, Prince Edward and Elgin Counties. They also settled in the Maritime colonies of New Brunswick, Nova Scotia and Prince Edward Island. The Quaker movement, or more accurately, The Religious Society of Friends, was formed in the mid-1600s in England when a small group of religious “seekers” came together under the leadership of George Fox. Family historians owe a debt of gratitude to the Quakers for their meticulous record keeping. Each “Meeting” (somewhat analogous to a “congregation”) kept meticulous minutes of their gatherings, and of births, marriages and deaths, as well as providing insights into their daily lives. In addition to these records, which obviously preceded the advent of civil registration, they also kept records of the movement of members to other locations, including from England to the North American colonies. If a member wished to emigrate from a community in England to a community in the American colonies, the exit or “removal” permission was recorded in the minutes of the Meeting which they were leaving and their arrival was recorded in the minutes of the Meeting which they joined upon arriving in their new area. As a result, these records may be useful to allow a researcher to determine where their ancestor went at a particular time, or where they came from, along with identifying the members of the family travelling together. These minutes of monthly and yearly meetings are often found in various archives, including in the Canadian Yearly Meeting (“CYM”) Archives. Fortunately, the CYM along with the Canadian Friends Historical Association (“CFHA”) a Canadian registered charity, have embarked upon a program of transcribing these hand-written records, and have made the completed transcriptions available to the public on the CFHA website. You can volunteer to help transcribe these wonderful records, or you can support the effort by making a charitable donation to CFHA or by joining CFHA and receiving their newsletter and journal. Visit their website for more details, or download the brochure and membership form below.